The campus is buzzing happily about the newly opened (October 17) Douglas B. Gardner '83 Integrated Athletic Center. But former President Bill Clinton was ahead of the curve and recognized The Doug's "green" qualities at the inaugural Clinton Global Initiative Conference, held in New York City in mid-September. Haverford president Tom Tritton traveled to New York to accept the accolades. The nonpartisan conference brought together a diverse and select group of current and former heads of state, business leaders, noteworthy academicians, and key NGO representatives participating in a series of dynamic, interactive workshops. The conference focused on the best methods to reduce poverty; to implement new business strategies and technologies to combat climate change; and to strengthen governance. 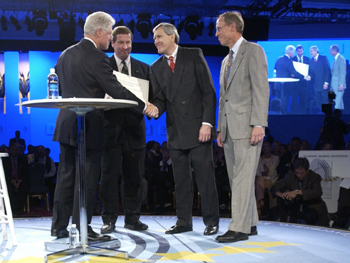 As Haverford, the U.S. Green Building Council (USGBC), and The Turner Corporation were singled out for their environmentally conscious efforts, Clinton announced a series of commitments aimed at transforming the way buildings in schools across the United States are designed and operated in order to reduce their energy consumption, environmental impact, and greenhouse gas (GHG) emissions. President Tritton has enacted a building policy at Haverford stating that all new construction will be environmentally friendly. If the Gardner Center passes the USGBC's stringent approval process, the 100,000-square-foot facility will be the largest athletic building in the U.S. to achieve certification under the organization's LEED Green Building Rating System.